“Rules are rules. The law is the law,” said prosecutor Brandon Long in a closing statements as he spoke for the government in the case against Witness Against Torture activists. Frida Berrigan’s recent column relates the details of the anti-torture activists trial and convictions for speaking out in the US House of Representatives as they petitioned their government to oppose the NDAA. It struck me as odd that the government chose to frame its case in terms of law, order, and decorum so as to protect civil society and Congress from disruption so that business as usual may carry on while the legal black hole that is Guantanamo persists. Of course, it comes as no surprise that a civil disobedience trial is reduced to a mundane evidentiary trial of whether or not activists did or did not do a certain thing, in a certain place, at a certain time with no consideration given to the context or content of their speech/action. In fact, it has become a quite commonplace—and effective—“tactic” for judges and prosecutors to appeal to the minute details of a statute so to ensure a finding of guilty rather than allow the courtroom to be a space for debate about the merits of the action’s political or moral dimensions. In cases of civil disobedience, judges are wont to avoid “judicial activism”—a term that refers to the departure from precedence and case law in a ruling that opens avenues for future legal defense that could acquit potential defendants. Sure, there are the rare exceptions where the court allows arguments such as international law defense or the “necessity” defense to be taken under consideration as legitimate motivation for a defendant’s action. The trials of the Creech 14 and the Hancock 38 were such events, even though the judge still issued guilty rulings in both cases. Appeals to the First Amendment rights to freedom of speech, peaceably assemble, or petition the government for redress of grievance often fall on deaf ears while prosecutors vehemently object to the relevance of the First Amendment when a defendant is accused of failing to obey a lawful order or blocking an entrance. The application of such legal code against nonviolent protesters represents a covert assault on the First Amendment as well as the stratification of power in increasingly less-accessible places under the guise of maintaining the social order. The court—the final arbiter of the state—cares more about decorum than it does about justice, truth, or democracy. So long as order is maintained, process is followed, and the courtroom kept clean from irrelevancies such as conscience or context, justice is served. What cares do the falsely accused, the unjustly imprisoned, or the abused (and their advocates)—whether they be in Guantanamo, Chicago, or an immigration detention center in anytown, USA—have for the observances of polite society while such grave injustices are bestowed upon them with such grace and dignity by their accusers and executioners? 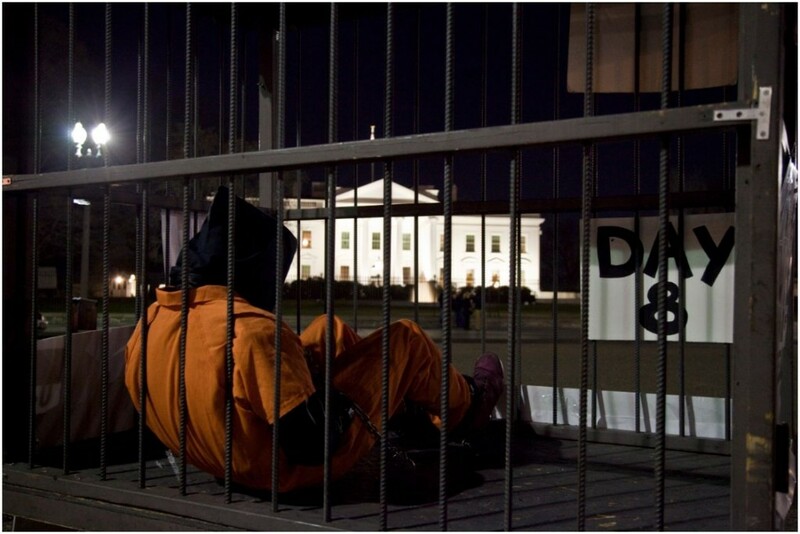 With today marking the tenth anniversary of Guantanamo, Witness Against Torture is in the midst of a 24/7 “cage” vigil in front of the White House. During my shift of Monday evening, I had a lively conversation with a gentleman whom I can only assume was an intelligence officer—he would not tell me his job but said he had spent time in Pakistani prisons. “Look at your stupid costumes. It’s not like that,” he said pointing to our 4’x6′ prison cell with a chained prisoner in an orange jumpsuit and black hood sitting in the middle of Pennsylvania Avenue. He accosted our vigil to “Shut Down Guantanamo” as missing the point. “The prison is one of the best prisons in the world,” he chided me, referring to the first-class treatment some of the prisoners receive. And indeed it may be, considering it costs the US taxpayer $800,000 per prisoner per year to run the detention center. “There are much worse prisons here in the US that need to be closed. I’d rather be in Guantanamo Bay than Riker’s Island [in New York].” Again, there is some truth to that but it continues to miss the point. Throughout our conversation, which was charged but worthwhile, he consistently affirmed that “our system works.” When I pressed him on the 89 men who have been cleared for release yet remain imprisoned indefinitely for no clear reason, he said it was unfortunate but that they will be released eventually. The fact that their status is “cleared”—which is itself problematic verbiage because more than 98 percent of the men in Guantanamo were never charged with something in the first place—is enough to prove that the system works, even if they remain imprisoned. That, to me, is a strange fashioning of justice. Dr. King’s words, “justice delayed is justice denied” is a useful frame for understanding the perverted system of justice that is occurring at Guantanamo and in prisons in the U.S. An obsession with decorum, with process, runs the risk of mistaking the trees for the forest. And indeed that has happened as men in Guantanamo and immigrants and other Americans in prison have been locked up—many in a manner that feels or is indefinite because of lethargic administrative procedures and the whims of judges and prosecutors—they are asked to be patient with what many consider the best system of justice in the world. And to some extent, that may be true. I don’t know. I’m not a lawyer or a legal historian. But I don’t believe that is a reasonable argument for the two million men, women, and children incarcerated in American prisons nor the untold thousands detained by U.S. military and intelligence agencies around the world. A system with flexibility, without creativity, without room to breath and grow and die and be re-born should be considered dead. What does a typical courtroom in America feel like? Serious, rigid, intimidating… dead. Contrast that with the feel of a General Assembly at an Occupy site. Or a truth and reconciliation circle that is typical in indigenous communities and in ancient wisdom traditions. These places are filled with spirit and life. Both can be tedious and frustrating but when boundaries are elastic instead of bound by decorum, the imagination is activated and truth begins to seep in. In spite of what the government may lead us to believe, decorum and democracy do not mix well together. Thousands of individuals learned first-hand what the experience of democracy is like: it is messy, time-consuming, resists being put into pre-fab boxes. Is that chaos? Hardly. Structure and order can facilitate democratic processes in way that creates space for truth and justice to be explored, challenged, pontificated, questioned, asserted, and debated by people with various styles and abilities to communicate. But when a clearly delineated process becomes the end goal as a standard of justice, the persons, histories, and contexts involved in the case are sidelined and a dangerous, undemocratic tunnel-vision emerges. A courtroom, generally, is not structured in an open, fluid way for candid dialogue because its intention, again, is not with truth and justice, but with fact and consequence. The poor and communities of color have especially known this, as have activists and sympathetic attorneys. So rules and laws serve a purpose. But all too often that purpose is misconstrued and the rules and laws that are intended to serve that purpose are abused or misapplied. So while rules are rules and the law is the law, progress and positive change demand that rules and laws be broken so that the cages that confine human flourishing may be torn asunder and that spirit set free. Let us quit mistaking decorum for democracy. Hi Jake, This is Monse from the “depth of nonviolent action” training in Chicago. Just wanted to thank you for the article. It was really interesting. Pls send my regards to the rest of the White Rose crew.